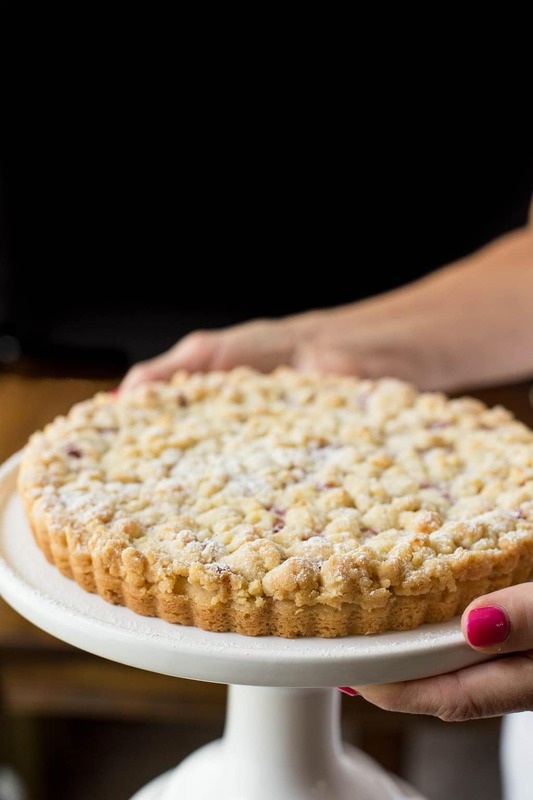 With sweet raspberry jam nestled between melt-in-your-mouth shortbread and a buttery crumble topping, this Raspberry Jam Shortbread Tart is beyond delicious! If you need a dessert that will bring “wows!” every time you serve it, you don’t need to look any farther! This Raspberry Jam Shortbread Tart is a tried and true go-to dessert for me and it never fails to please. And I had to laugh when one sweet friend of ours asked for “a moment of silence” after she took the first bite. So she could, “savor every morsel without distraction!”. The original recipe (from Sticky, Chewy, Messy, Gooey) called for baking the delicious treat in a 9×13 pan, yielding lots of bars; perfect for picnics, potlucks and bake sales. I halved the recipe and used a 10-inch tart pan which makes an elegant dessert presentation. Since raspberry jam is the star ingredient in this wonderful dessert, you’ll want to use a good quality jam. I like to use this Overnight Raspberry Freezer Jam, but if I had to use a purchased jam, I’d go with Bonne Maman Preserves or something similar. I love that the crust and the crumbly topping of this dessert are made from the same dough. 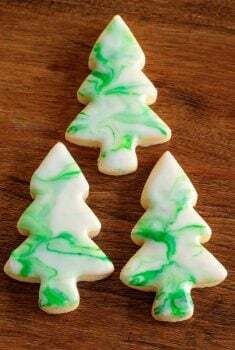 It’s a one-bowl, no-mixer, melt-in-your-mouth shortbread dough which includes butter, sugar, all-purpose flour and almond flour. Half the dough is pressed into the bottom of the pan and par-baked, while the other half gets tossed in the freezer to make for easy crumbling. What is almond flour? It’s just almonds, ground till they’re fine and floury. I find it fascinating that a small portion of almond flour not only accents the flavor of raspberries and other fruits, but it also adds a mysterious touch of fine European flavor to desserts; a deliciousness no one can quite figure out! 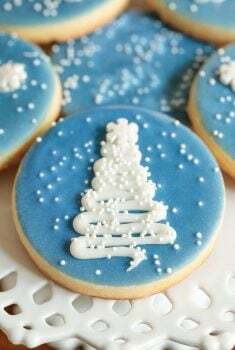 A light dusting of powdered sugar is optional, but adds a really pretty touch. This Raspberry Jam Shortbread Tart is delicious on its own, but served warm with a scoop of vanilla ice cream or custard takes it into the “nirvana” realm! I like to drizzle a small spoonful of raspberry jam over the melting ice cream and garnish it all with a tiny sprig of mint. Need a yummy dessert for a dinner party coming up? Maybe you’d just love to surprise family/friends with something special (but easy)? This one doesn’t take long to put together; definitely under an hour. You’ll hear “wows” when you bring the pretty tart to the table and “oohs and aahs” with the first bites. Oh, and don’t act a bit surprised if someone asks for “a moment of silence”. Almond flour is simply almonds that have been finely ground. Since it’s made from almonds it’s expensive, but you don’t need much to add amazing flavor. I keep mine in the freezer and it lasts forever. You can find it at most larger groceries, Trader Joes (good price) and online. I use my Overnight Raspberry Freezer Jam but any good quality raspberry jam is fine. I really like Bonne Maman Preserves if I don’t have homemade. For a pretty look, I like to reserve about a tablespoon of the jam. 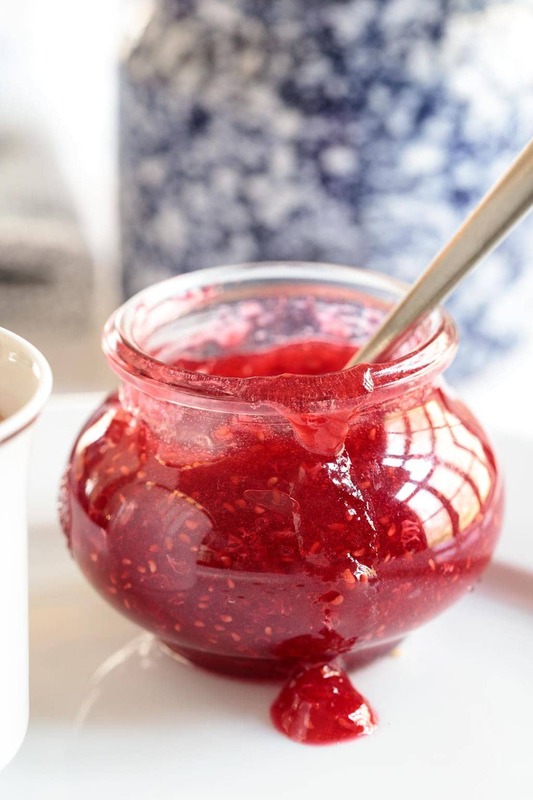 After I add the crumbled topping, I drizzle the reserved jam with a small spoon into the cracks and crevices between some of the crumbles to look like it’s peeking out. Otherwise, the topping will cover the jam, still very pretty but I think it’s enticing to see a little of the jam peeking through. Since this recipe doesn’t require a mixer, make sure your butter is very soft. Sometimes it’s difficult to soften butter, especially during the winter months when the house is chilly. I like to soften mine in the microwave with the light left on. I don’t even start the microwave. The small amount of heat from the light is enough to soften the butter within about 4-6 hours. You can also soften cold butter by placing it in the microwave and setting the power on 10% for about one and one half to two minutes. Watch it closely the first time as every microwave is different. You’ll learn exactly how much time it takes for your microwave. You can use either a 9 or 10-inch pan for this recipe. 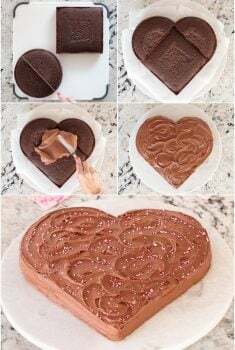 I really like to use a tart pan with a removable bottom but it could be made in a 9-inch cake pan if you line the pan with parchment paper. I love to use a Danish whisk for mixing up bread and cookie dough as well as cake batters without having to pull out the mixer. My Danish whisk is a small but essential little workhorse in my kitchen! I like this one and love that it comes in a set so you can keep one and give the other to your favorite cooking buddy! P.S. See those fun powdered sugar “sprinkle” pictures above? It’s a bit tricky to get images like that so we do some lots of practice shots before we try to catch the real deal. Thought you might enjoy seeing one of the “before” shots. This Raspberry Jam Shortbread Tart was originally shared in 2016. It’s one of our favorite recipes ever and we didn’t want it to get lost in the Café archives of over 1,000 recipes. So we tweaked the recipe (to make it easier), updated the images and present it to you today for your baking pleasure! 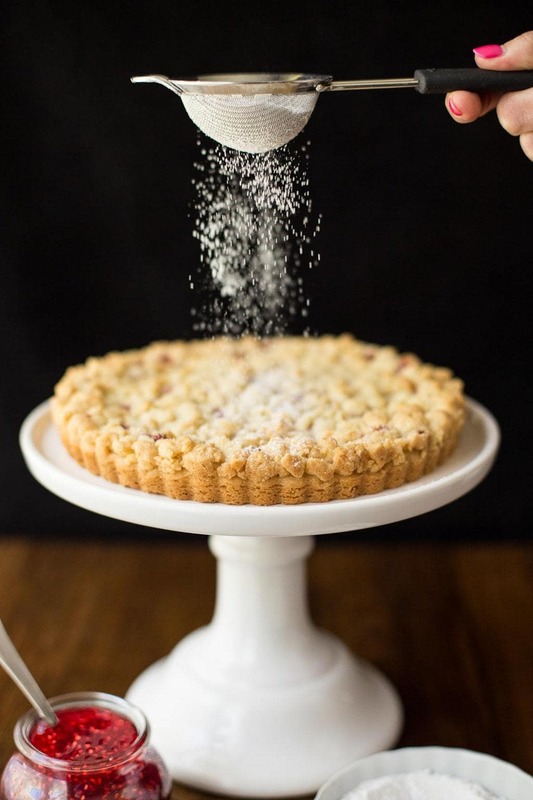 With a layer of sweet raspberry jam nestled between the crisp, melt-in-your-mouth shortbread crust and buttery crumble topping, this Raspberry Jam Shortbread Tart just might be one of the most delicious desserts ever! Position a rack in the middle of the oven and preheat to 325 degrees. Combine the butter and sugar in a large bowl. Using a sturdy spatula or Danish whisk, beat until creamy. Add vanilla and salt and mix until combined. Add the all-purpose and almond flours and continue to mix until flour is incorporated and large crumbles start to form. 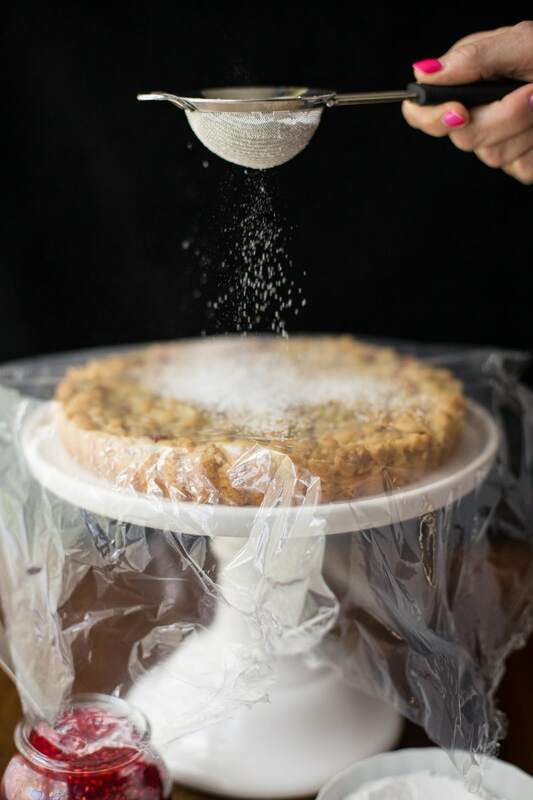 Spray a 9 or 10-inch tart pan with baking spray or grease well and press one half of the dough evenly into the pan to form a bottom crust. Wrap the remaining dough in plastic wrap and freeze while the bottom crust is baking, (no longer than 15 minutes). Place the tart pan on a baking sheet and bake for 10-12 minutes, until the crust is just beginning to firm and turn pale golden brown at the edges. Remove the pan from the oven and allow the tart to cool for 10 minutes, then spread the raspberry jam/preserves evenly over the crust, leaving a 1/4-inch border around the edge. (see notes above for a pretty presentation tip). 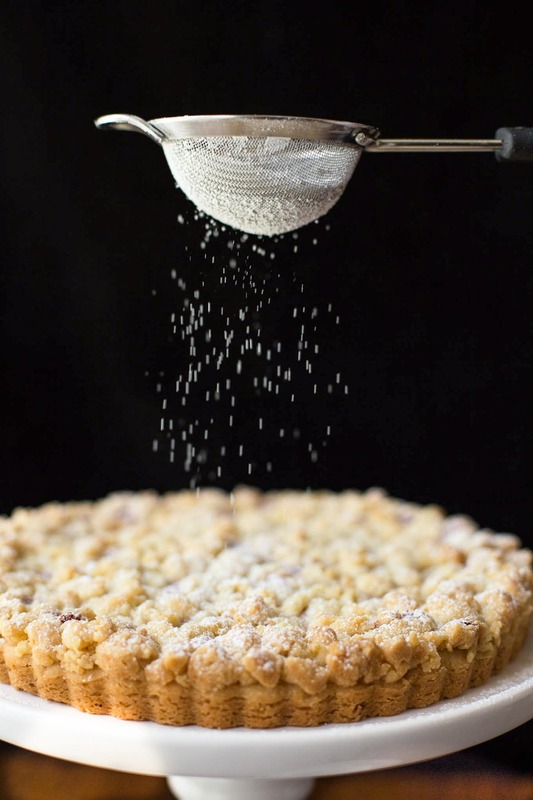 Remove the remaining dough from freezer, and with your fingers, sprinkle it in big crumbles over the jam to form a topping. Return the pan to the oven and continue baking until topping is firm, crisp and lightly golden in color, about 25-30 minutes. Transfer to a wire rack and let cool to room temperature, then dust lightly with powdered sugar, if desired. Use a sharp knife to cut the tart into wedges. Serve warm (I used the microwave for about 10 seconds for each wedge) with a scoop of vanilla ice cream or frozen custard, if desired. Dessert can be made 6-8 hours in advance. It can also be made and frozen after cooling. To serve after freezing, allow to thaw, then warm for 10-12 minutes in a 300˚ oven. See Café Tips above for more detailed instructions and further tips. The Café Sucre Farine is a participant in the Amazon Affiliate Program. Affiliate programs are designed to provide a means for sites to earn advertising fees by advertising and linking to products on Amazon. The price you pay as a consumer does not change, but if you make a purchase through one of our links, we receive a small commission – and we continue delivering delicious recipes to you! So glad you enjoyed it Debra! It really is a winner! Awww… so happy you enjoyed it! I’ve decided that my tart pans have been inactive far too long! My gosh this looks delicious and the powdered sugar on top is an absolute must. Thanks Sandra! Fall is the perfect time to give those tart pans a good workout, isn’t it? 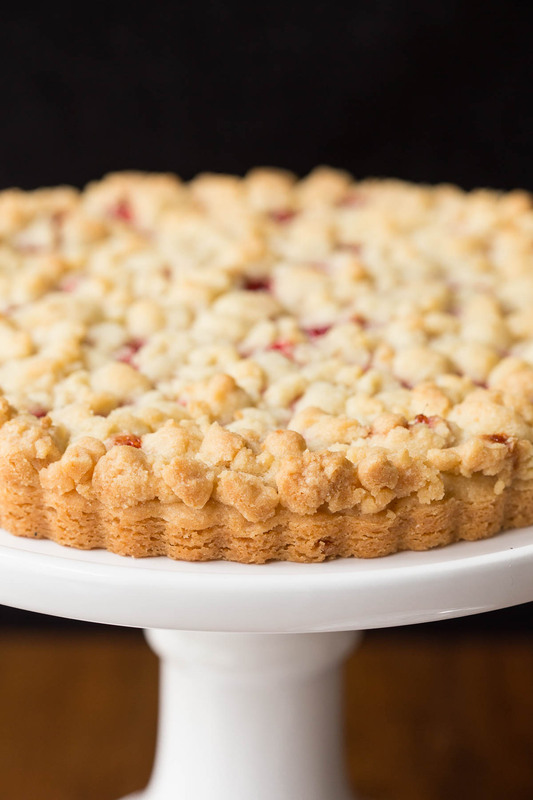 This is my kind of tart, I love that pretty hint of jam peeking through those buttery crumbs! This lovely tart sounds like perfection to me. I love the combination of buttery shortbread and fruit! It would probably also be amazing with other flavors of jam as well. Absolutely Wendy! It’s kind of a template recipe, isn’t it? This recipe is so easy and the tart is absolutely delicious! Thanks so much for sharing! You’re so welcome Christine, enjoy! Love the action shots! And one of Scott’s top 5 ever? Wow! You’ve made so many wonderful desserts, this must be extra good. Sure looks it — terrific recipe. Thanks! It’s hard to beat John, just simple and incredibly delicious! What a great summer dessert. Now a moment of silence please while I imagine how great this might taste! Hi Chris! I’m so happy I ran across your site! I have pinned SO MANY of your recipes! I think you and I could be great friends …we have such similar tastes!! 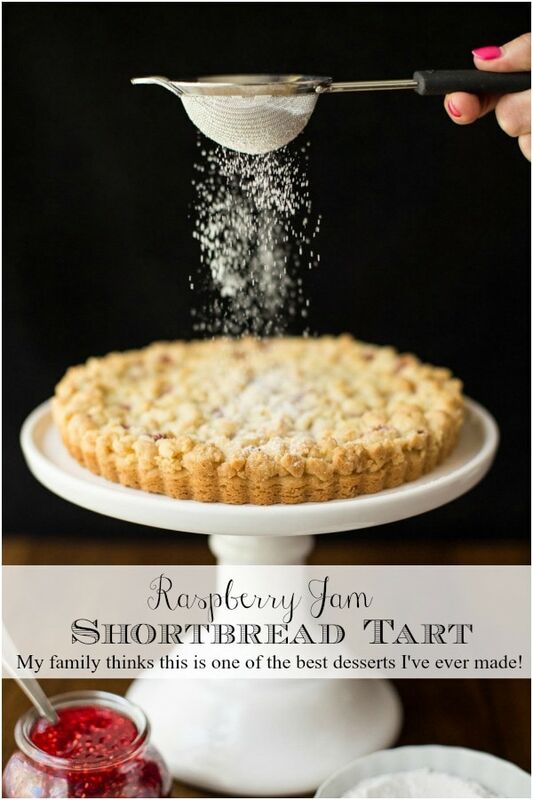 I can’t wait to try this Raspberry Jam Shortbread Tart!! Thank you for your sweet, sweet comment! I really think you’ll love it, it’s that good! 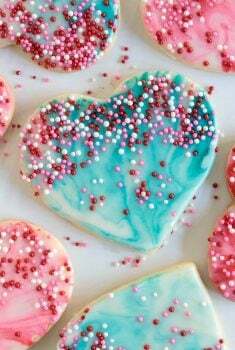 Dig a little deeper in the website and you’ll find a bunch of shortbread-inspired recipes. 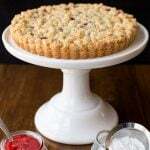 This looks delicious and reminds me of an old English Bakewell Tart! That’s interesting Barb! I love bakewell tarts; we’ve had them on our visits to England! You can bring on all the distractions because if I was savoring a slice of this decadence, there’s no way I’d be distracted at all! 🙂 This is so delightful to look at – so buttery, so crumbly, so amazing – and only 7 ingredients! Thanks Shashi! It is really very simple to put together – but oh, the taste! Thanks Katarina, I know you’ll love it! Such a simple recipe packing a big yummy punch! Bill, who loves raspberry jam, would definitely agree with Scott! By the way, I know where you learned that powdered sugar trick 🙂 Perfectly executed!!! Thanks Liz! If Scott could figure out a way to incorporate that tart into each meal, I think he’d do it! What a gorgeous tart, Chris!Summer is written all over it. Thanks Denise! It’s a wonderful, simple, delicious treat, anytime! Jo Anne, I’m right with you on those versions – let us know how they came out! How gorgeous! And the photos of the powdered sugar sprinkling down are super! Thanks Ginny! We’ve been practicing different “looks” with the sprinkle and pour shots recently, since our visit and workshop with Lindsay from Pinch of Yum! We get so inspired when we interact with other fun bloggers! You too Tricia! It’s such an understated dessert…. but sooo good! Could one use regular flour? I have a severe nut allergy so I am unable to use the almond flour. Yes, you could definitely use all regular flour. Just replace the same amount of all purpose flour for the almond flour. This looks like a ‘keeper’. Shortbread is one of my weaknesses, and while raspberries aren’t my favourite I will try it as posted before I begin to fool around with other preserves. Let me know what combinations you come up with! 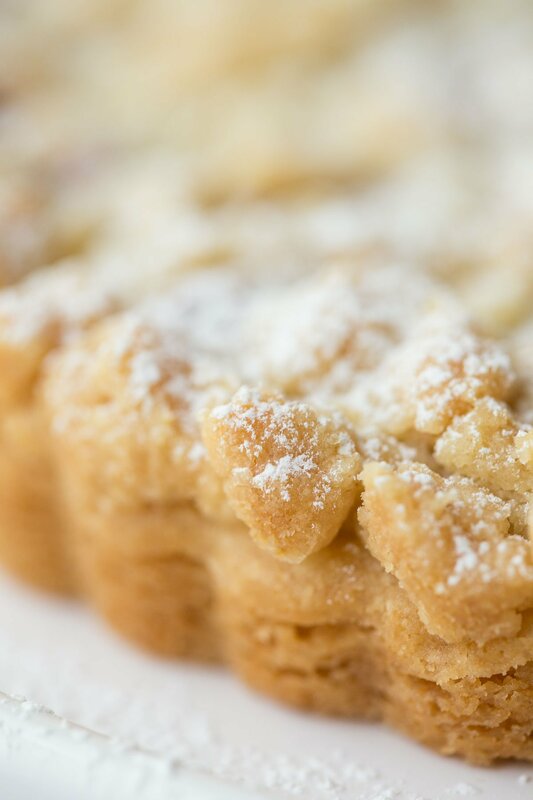 Beautiful tart Chris, almost too pretty to eat, almost…….love crumbly desserts! I’ve always been a sucker for crumbles Cheri! Oh my, so beautiful! I was just looking at a site which carries Devon Double Cream….it would go so well with this, don’t you think a big dollop on top would just hit the spot? Such a simple list of ingredients and such a mouthwatering tart — love this one Chris! Yeah, that’s what drew me to it – so simple… and darned delicious! Well you know me and shortbread Jennifer! It is a stunningly, delicious dessert! Sweet, buttery and melt-in-mouth…o Chris, this is absolutely heavenly! Thanks Angie! We could probably eat this for dessert every night – not a good idea! It’s that amazing!